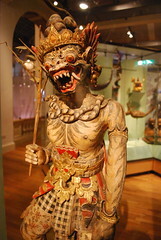 The epic Ramayana, while originally from India, has had a far-reaching influence into the cultures of Southeast Asia where it is retold through reliefs on temples as well as traditional arts like shadow-puppetry and dance. Of course, the story gradually becomes adapted to the local culture, and it seems that the Javanese version of Ramayana contains some significant differences from the original. These differences are only now coming to light as some of the more ancient Javanese texts become translated.